Lighting-Gallery-net - circline and u-bent fluorescent tubes/Philips China 22w circline on a Killerwatt adapter. Real circline this time. Philips China 22w circline on a Killerwatt adapter. Real circline this time. Finally one that’s shaped like a real circline. Not crooked and out of round. 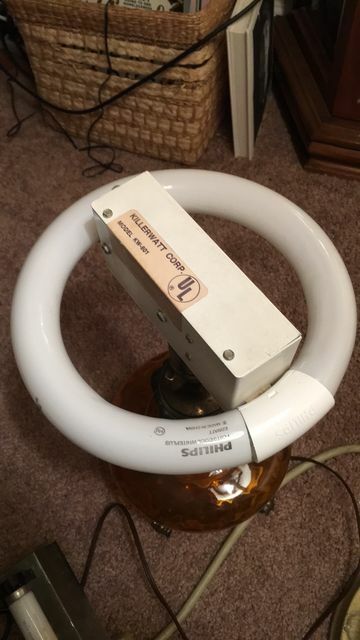 The Killerwatt unit is from 1977 and I still have the original GE warm white lamp. Finally! How about the GE and Sylvania ones? The GE circlines made in China are a perfect round. Not sure about the quality. Sylvania circlines were made in Indonesia until 2012, no idea since then.